By 2030, China’s CO² emission will be equal to the world‘s CO² production today if the country keeps pace with its economic growth. Industrial waste pollutes soil, river, and air resulted in three-quarters of a million Chinese die due to pollution. Especially in the case of China, it has the largest coal consumer and producer in the world, only 1% of 560 million urban residents breathe safe air by European Union Standard. China which has been rated one of the most polluted countries will have to feed the ever-growing population and demand, industrial factories and habitats would have to coexist or otherwise, the future generation shall experiences a great devastating land of waste. Industrial waste and coal burning which contributes 75 percent of country electricity at the same time putting people at high risk from suffering cancer, chronic respiratory diseases and cardiovascular diseases due to the excessive amount of sulfur dioxide and carbon discharged into the air, soil and river. The ever-increasing demand due to the overpopulation issue introduced no other solution but high-rise living and resulted in a change from agriculture to industrialization, can living fabric and industrial factories really coexist? 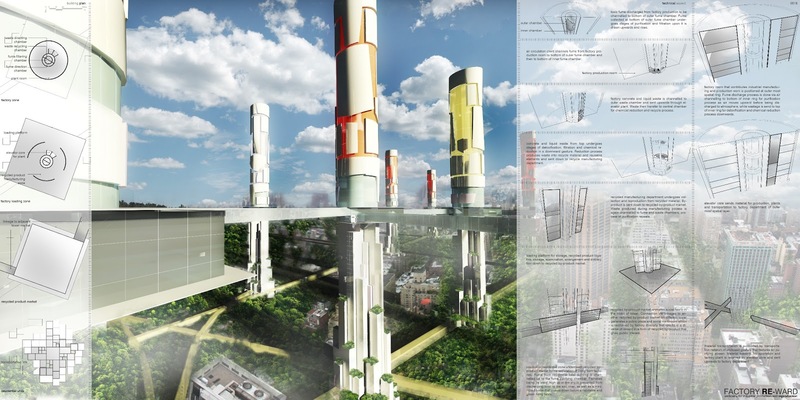 This project manipulates verticality of a skyscraper in generating industrial production to feed on country’s economic growth, at the same time an industrial waste treatment and reproduction through recycling technology. Repositioning of factories high above the ground made separation of habitat and hazardous pollutions possible. Fume rises through layers of filtration compartments before being discharged into the atmosphere, while recycling and purification processes take place when industrial waste is channeled from top to down below through various stages of chemical reduction and filtration. Permutation from a horizontal configuration of factory plant into a vertical factory suggests a better city land-used where people and greenery can coexist with the elimination of industrial pollution in the forms of fume and noise. Industrial production and power generation through coal burning which is essential for China is improved by recycling alternative, at the same time eliminating the energy need and pollution to transport waste to a treatment site. Electronic waste, hazardous chemical discharge, coal production, plastic and glass bottle manufacturing and other generate industrial diversity which would in turn generate new tower typology, giving middle layer from tower to tower a market with variety of recycle by-product, while fume from housing coal burning and factory fume which has been catastrophic will be channeled to vertical chamber for purification before being released into the air. 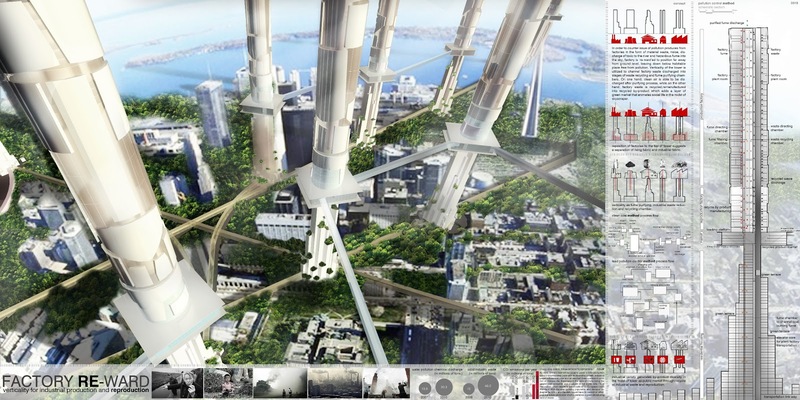 Recycling by-product is generated in the center of the tower that adds another layer of social fabric which would animate the public life in the midst of skyscraper and leaving down below a green living condition that is free from industrial pollution, but maximum land-used with coexistence between habitats, greenery, and housing.